It may be an odd choice for some, but for businesses within the sporting and leisure markets, branded hats are a great way to promote products and services as well as your business in general. Promotional straw hats offer added sun protection and style, and allow you to market to a wider audience. A day at the cricket, a weekend music festival or a day out on the water, a straw hat is the way to go. Brand Republic offers a range of straw hats, suitable for any business in the sporting or leisure markets looking to promote their brand. 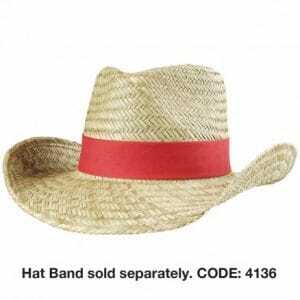 The Cowboy Straw Hat is made from breathable straw with an internal sweatband. Featuring the classic cowboy hat shape, these hats are available unbranded, or you can purchase the hat brand separately. The Cowboy Straw Hat is well made, durable and comes in a range of sizes making it a great fit for any business. The classic Straw Hat with toggle is perfect for those in the leisure market. It’s great for backyard BBQ’s or a day out on the water. These hats have a pre-attached hat band that can’t be decorated, but you can purchase a separate hat band to be branded. The Straw Hat features green anti-glare fabric under the brim, as well as a terry towelling comfort sewn into the hat. Branded and promotional hats are a great way to promote any business, and many companies are starting to jump on board. Hats will help sell your brand long after they’ve left your shop or office. When you’re looking for your next promotional product, take a look at EzyCaps.